Integrated power and lockable doors, which fold back complete 270 degrees, held in place by strong magnetic catches when open. Manufactured from MFC with soft corners and assembled around a fully welded powder coated steel frame. A sturdy unit with a contemporary look that’s easy to move and hold in place on braked rubber wheels. One tilt shelf for accurate positioning of projected image. Three sliding shelves to hold DVD or VCR devices and two internal fold out speaker shelves. 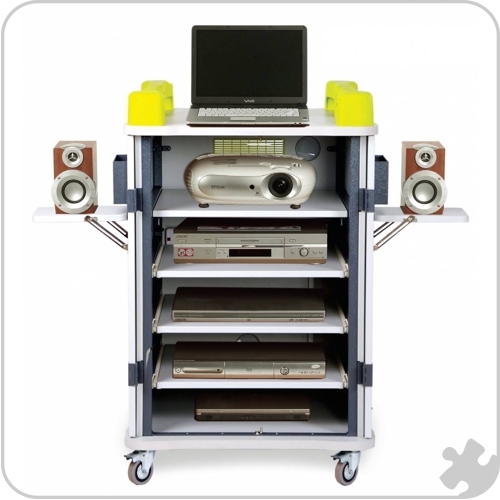 Convenient internal storage bins for CDs, remote control etc. Air vent for heat reduction when charging. Two cable ports and a handy cable winder for safe and neat equipment storage.